The IAR 80 was a Romanian World War II low-wing, monoplane, all-metal monocoque fighter and ground-attack aircraft. When it first flew, in 1939, it was comparable to contemporary designs such as the German Messerschmitt Bf 109B, the British Hawker Hurricane Mk.I, and the American Curtiss P-40B/Tomahawk Mk.I and superior to the Dutch Fokker D.XXI and Polish PZL P.24. However, production problems and lack of available armament delayed entry of the IAR 80 into service until 1941. It remained in front-line use until 1944. Built in several variants, the final stage in the IAR.80/81's wartime history was the 81C. This version changed the guns once again, this time to the Mauser MG 151/20 which was replacing the MG FF/M in German service and had just been released for Romanian use. The order for the 81C was placed in May 1942, predating the second order of the 81As. "Our Lightning attack came as a complete surprise to the Americans. Our attack was so quick that not one of the 100 (sic) American aircraft managed to fire a single shot at our aircraft parked on the ground. Everything happened between ground level and about 2,000 meters (6,600 feet), and was total confusion. I was excited and proud of my "mills", the IAR 80s, which, thanks to their extraordinary agility, remained victorious in the air. I saw their crazy dives, quick rolls, reverse turns and inverted flying, always with just brief burst of fire to save ammunition. It was an incredible sight, but also a drama for the Lightning pilots, who, at this low altitude, were inferior to the ever-present, nimble IAR 80s". The USAAF lost 22 or 23 P-38s on that day. Eight were claimed by Grupul for themselves – the rest were claimed by the Luftwaffe and by anti-aircraft fire. The Americans claimed 23 victories, although the Romanians and Germans each reported only one aircraft lost on that day. The American account of this battle conflicts significantly with the Romanian one. 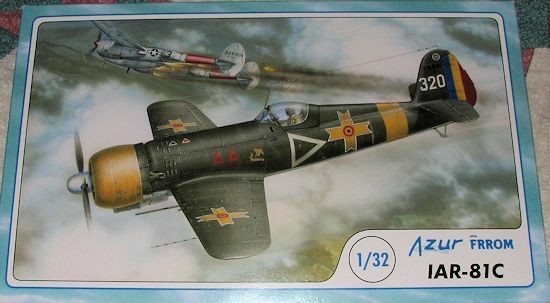 Fighter pilot Herbert "Stub" Hatch, who took part in the dogfight, wrote that his flight of 16 P-38s, the 71st Fighter Squadron, was challenged by a large formation of Romanian IAR 81C fighters that he misidentified as Focke-Wulf Fw 190s. According to Hatch, the fight took place at and below 300 feet (100 m) in a narrow valley. Hatch saw two IAR 81Cs hit the ground after taking fire from his guns, and his fellow pilots confirmed three more kills from his guns, making Hatch an ace in a day. However, the outnumbered 71st Fighter Squadron lost nine aircraft. The Americans never again repeated the P-38 dive-bombing mission profile over Romania. This is Frrom's first venture into 1/32 scale and they picked a perfect example in the IAR-81C. For those unaware, Frrom tends to concentrate on Romanian subjects with help from Azur in developing the kits. I have been awaiting this one since I was first told about it earlier this year. Molded as you would expect a kit from the CMK family of short run kits, the detailing on this one is superb. Finely engraved panel lines that are not too deep and are quite crisply done. I did find a touch of flash and a couple of the thicker parts had sink areas that will need to be filled. There are also some ejector towers that you may wish to remove before construction. These are on the larger pieces. 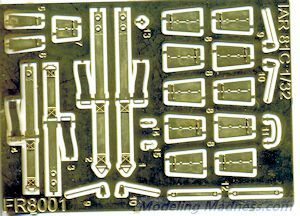 The kit comes of five grey plastic sprues with a clear sprue for the canopy, windscreen, wing tip lights, and reflector glass. 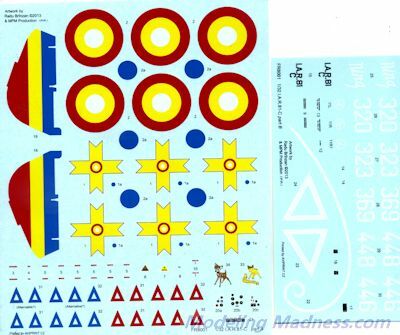 None of the part numbers are printed on the sprues so one will be continually referring to the sprue diagrams when building the kit. Resin is used for the exhaust, gun sight and the carb intake, offering a standard and filtered piece. A nice photo etch fret is also provided containing a seat harness, canopy grab handle, elevator trim tab control hinges, rudder foot straps, and cowl flaps. Frrom could have done a much more extensive set, but decided to do a lot of the very small pieces using injected plastic instead and I am pleased at their choice of material as I'm sure many other modelers will be. 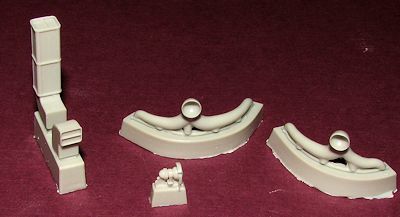 This does bring up a down side in that I found several thin pieces already broken on the sprues. The location of the sprue attachment points on these thin pieces means that even more will be broken simply removing them. 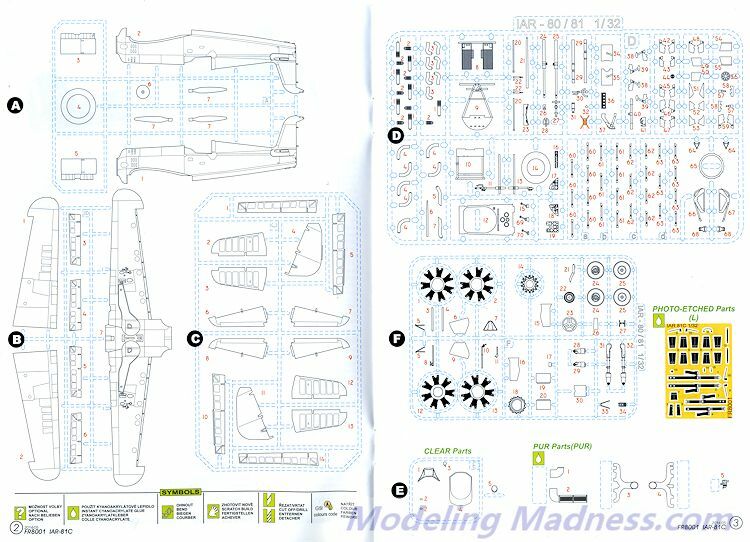 It is rather standard stuff for kits of this nature and why they are recommended for experienced modelers. With such a large scale to work with, one will not be surprised that there is a ton of detail. The cockpit has a lot of this with the various framework pieces, a very well done seat, floor, armor plating, trim wheels and instrument panels. Decals are provided for instruments. There is also quite a bit of sidewall detail with various control levers and knobs. I found it interesting that the interior color for this aircraft is a light blue grey rather than some sort of greenish shade. This color is also used in wheel wells and inside of gear doors. Speaking of gear doors, each one is separate and has separate pieces that are used to attach them to the gear struts. The gear themselves are superbly molded with separate oleo scissor sections and a nicely done retraction strut. The tail gear is a skid type. Wings are a single lower pieces to set the proper dihedral with separate upper halves. All the control surfaces are separate. The ailerons have separate hinges and the flaps can be displayed lowered if one wishes. Looking at a lot of period photos, there was not 'standard' position for the flaps as I found images of them parked with them both up and down. Elevators and rudder are also separate. The kit has a superbly done engine that is a model in its own right. There are separate pushrods as well as a very complex engine intake and exhaust piping arrangement. You'll be spending quite a bit of time on this part of the build and it is a shame to have to hide much of it in the cowling. The cowling itself is two halves with a single forward section so no worries on seams. The cowling has separate cowl flaps and the instructions show exactly where these fit. An optional bomb rack is included if you should so desire. Also separate is the windscreen and canopy which most will want to pose open to show off the interior detail. The prop has separate blades that are keyed. Instructions are a bit on the busy side with well drawn construction steps and for the first time, there is color on every page of the instruction booklet. Paint references are Gunze with generic, RLM and FS 595 references given where appropriate. Five markings options are provided, all of which are Olive Green and Light Blue-Grey. Most have yellow cowlings, fuselage bands and lower wing tips. The first three options are with Escadrilla 61 or 62, Grupul 6 during 1944. The fourth is a pro-Allies plane with white fuselage band, white upper and lower wing tips and a bare metal forward cowling. The fifth is from Escadrilla 67, Grupul 2 with Eastern Front markings but only the lower cowling in yellow. This one also has a white spiral on the back spinner (or perhaps the other way around!). The decals are superbly printed by Aviprint. Separate blue triangle formation markings are provided as it is difficult to tell from photos if the were red or not. Several of the options have either plane names or unit badges. I am quite pleased to see this one being offered and will be starting on mine right away. It is an important aircraft to the Romanian Air Force and one that I know will make into a superlative model. Thanks to Gilles Fontaine of Frrom for the preview kit. It should be available in stores very soon. Visit www.frrom.com for more information.